The Sunpower 60W Solar Panel is the most powerful, foldable solar panel from Powapacs, equipped with efficient SunPower solar cells. With the power of 60W and the combination of USB and DC output, this solar panel is ideal for charging your Powapacs and other devices. The SunPower solar cells are, with an efficiency of >23.5%, one of the most efficient solar cells which are available at this time. With the power of 60W, the Powapac solar panel can generate 150 -230 Wh of energy daily via the output interface. . This energy can be used for charging smartphones (on average about 10-15 times), tablets, iPads, USB cameras, USB lamps and other devices with a USB connection. In addition to the USB outputs, the Powapacs 60W Solar Panel also has a 18 V DC output. This output is especially suitable for charging ATOM and other Power Banks. With a combination of the Powapacs 60W solar panel and ATOM Power Bank, you have a versatile, handy and portable of grid system to keep you powered wherever you go. 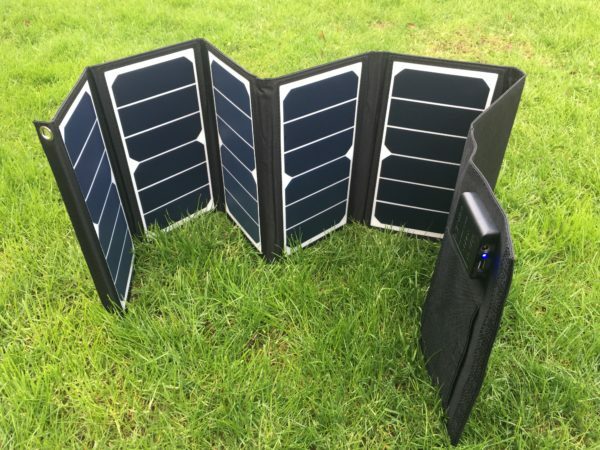 To use the solar panel and the generated energy as efficient as possible, connect ATOM or other power bank, in which the energy can be stored. This will allow you to charge your devices at any time (including in the rain or at night) via the power pack and you are no longer dependent on the sun. 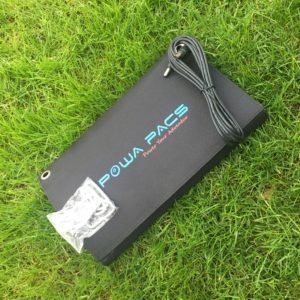 In very good weather conditions a laptop can even be connected directly to the Powapac 40W Solar Panel. On an average summer day in the UK, you could expect the equivalent of about 6-7 hours of STC illumination on a panel pointing towards the sun. Hence a 4W panel could generate about 24-28Wh per day, with a 100W panel producing 600-700Wh. That’s 2-2.3Ah stored in your battery with the 4W panel or 50-58Ah with the 100W one (calculated by taking the energy figure and dividing by 12, the battery’s voltage). In winter, however, you could be as low as 0.8 STC-equivalent hours a day, so that same 4W panel will only generate 3.2Wh and the 100W panel 80Wh, topping up the battery by a tiny 0.3Ah and 6.7Ah respectively. Duel output (18v & 5v). 2.1mm DC cable to allow remote charging. When using a solar panel, don’t forget that even the shadow of a thin wire can make a difference to the power output. Make sure as many cells as possible are in full sun. Solar panels will work behind glass, but with limitations. They are designed for direct sunlight, so if you put a panel behind glass or a plastic window its efficiency will be reduced. It may take up to three times as long to provide the same charge to a battery if you put the panel behind a window, even if it’s in full sun. If you invest in a solar panel, make sure it’s positioned to take advantage of the midday sun, which is the strongest. This is almost directly overhead in summer, but lower in the southern part of the sky at other times of the year. Angling your panel towards the sun will increase the energy it generates outside of the summer months. The power you generate from your solar panel will only be as good as the condition of your Voltz/Powapac battery, so it’s worth looking after your battery. The power generated by a solar panel is direct current (DC), so if you want to use it to power something that would normally plug into a home-style three-pin 230V socket you’ll need to use Atom thats equipped with an inverter. A solar panel can be ideal for keeping your battery topped up during winter storage, especially if you have a caravan or motorhome with a battery-powered alarm system. To take account of the low light levels in winter you may need a 20W panel or more.